[Here’s Billy’s ticket and analysis for Saturday’s Late Pick 4. Tough start to last week’s Pick Four as Devilish Love, a horse I respected but played against, won in a photo finish to kill the ticket after the first leg. Weather should be a non-factor again, and the two turf races in the sequence should be run over a firm turf course. The Grade II Amsterdam kickstarts the Late Pick Four, and there are reports of two scratches. Noble Moon and morning line favorite Rock Fall appear to be out of the race, leaving us with a field of seven. Coup de Grace was overmatched two back in the Woody Stephens and found the winner’s circle against weaker company at Delaware earlier in July. He’s now the probable post time favorite. Tiznowforamerica is 10-1 in the morning line, coming off a win at the Amsterdam distance of six and a half furlongs. Captain Serious is the speed in the race and turns back in the Amsterdam. Expect him to try to wire the field. I’ll go four deep in this optional claimer. Palace Dreams is coming off a layoff, but she’s run well in her two races at Saratoga. She should be able to save ground from the inside with Jose Lezcano. Miz Owellcouldn’t hang on going one mile on a yielding turf course at Belmont, although she won three back with the extra sixteenth of a mile and another yielding course. You can make a case she’s better without a firm course, but she’s 2-for-5 this year and didn’t get the best of rides in the Mount Vernon. Lady’s Lunar Luck gets back to a more suitable distance after running out of gas going one mile and an eighth. Has hit the board in all four starts at the Spa (2-1-1). The Lady Says Yes makes a second start off the layoff and is another one in the field who likes the Saratoga turf. Just to mention a couple I won’t be using, Caribbean Beat is a nice horse, just doesn’t seem to win. Chow Fun may be compromised by the extreme outside post. I’m chalking it out in the Jim Dandy with Tonalist and Wicked Strong.The Belmont Stakes winner will probably be stalking Legend, who appears to be the pace on paper. The blinkers on Wicked Strong should only help. Of the others in the field, I like Commanding Curve, but don’t think the pace will be hot enough for him to be kicking late. Same can be said for Kid Cruz. Tonalist and Wicked Strong are the class of the field. The value won’t be there, but they are the obvious choices in a small field. A huge field completes the card. Twelve horses are entered, only one of which is a MTO. There are a few horses that I’ll use coming out of a June 25th race at Belmont. Elroi is putting up consistent figures and continues to finish in the money. Note the winner of the race two back ran a respectable fourth on Thursday. Trainingforsuccess ran third on June 25th and offers a bit of value at 10-1 morning line. First start in the Mitchell Friedman barn and gets a rider change to Junior Alvarado.Bluegrass Flash is another one who is in contention each time he steps on the track. Joel Rosario sticks around and enters this race with experience on turf for Christophe Clement. Ballybrit couldn’t wire the field for one mile and a quarter. However, cutting back to one mile and a sixteenth improves his chances of wiring the field as one of the few speeds on paper. I can’t ignore Tapitation either. No worse than second in five career starts. Poliziotto hasn’t run in over a year, and I can’t endorse him at what will likely be short odds with a 12-month layoff. 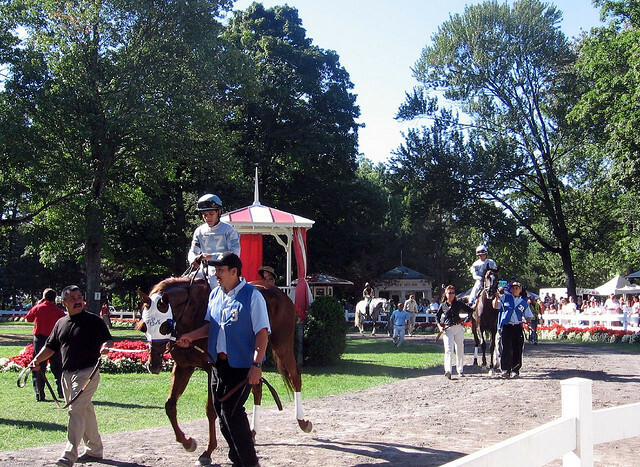 Image: Oliver Mallich, “The Paddock at Saratoga.” Copyright 2007. Creative Commons 2.0.